get outstanding artists from around the world to poetic positioning in the Academy of Arts Hanseatenweg. Included are Zang Di 臧棣(China), LaTasha N. Nevada Diggs (USA), Jochen Distelmeyer (Germany), Elena Fanailova (Russia), Reiner Kunze (Germany), L-ness (Kenya), Mario Z. Nemes (Hungarian) , Christian Prigent (France) and Lisa Robertson (Canada). Weltklang is a concert of verse in voices and languages. The poets and poetesses read in their native language, without translation eingesprochene – for this evening an anthology of the German translations of the poems appear to read along. 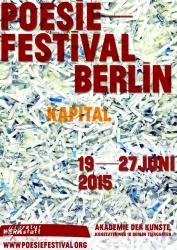 The 16th poesiefestival Berlin will take place from 19 – 06.27.2015 in the Academy of Arts, Hanseatenweg 10, 10557 Berlin. The Berlin poetry festival is a project of the Literature Workshop Berlin in cooperation with the Academy of Arts and is sponsored by the Capital Cultural Fund.